If you are a recording musician, why do you need an audio interface? It is true that the sound cards built into your computer or tablet are indeed audio interfaces. However, the standard sound card built into computers or tablets do not allow for quality recording. They also lack the proper inputs and outputs for recording. Audio interfaces provide you with everything you need to do quality recordings. If you are on the market for an audio interface, you will likely notice that the most popular choices are USB interfaces. This is because they are the simplest to use and versatile since you can hook them up to different devices. ​Another reason people buy audio interfaces is to transfer music or other recordings from cassette tapes into a digital version. 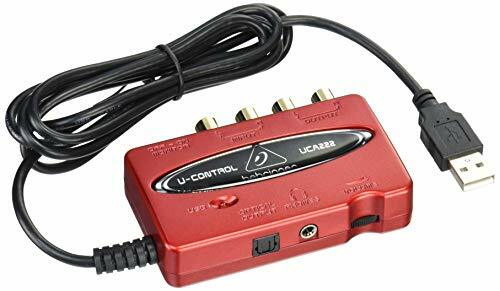 One popular USB interface is the Behringer U-Control UCA22. To help you decide if this is the one you should buy, we have put together a product review based on what users are saying. As already stated, many people prefer the USB option when it comes to interfaces since they are the easiest to use. A great interface needs to have a simple set up. You should just have to plug it in to get started. Some other types of interfaces can be hundreds of dollars, but the USB ones are much more affordable. A great USB interface will be high in quality but you won’t have to break the bank to buy one. One of the reasons people love the USB option is because they can easily be swapped between systems. A great interface will also be small and light so that it can be carried in your bag without weighing you down. Between trips to and from the studio, interfaces can get knocked around a bit. It is important for them to be able to withstand some knocks and bumps without being damaged. The exterior should be made of a strong material. Last, but definitely not least, a great interface needs to provide excellent sound quality. Recordings should be crisp and clear and even subtle sounds will be audible. Designed to work with your PC or Mac computer, the Behringer U-Control UCA222 is bus powered so it requires no external power supply or batteries. It doesn’t require any drivers. All you have to do is plug it in a free USB port and start recording. The U-Control UCA222 allows you to connect pretty much any piece of audio gear to your computer. This allows for versatility in your recording. Featuring two analog inputs, you can connect any line-level device, such as a tape deck or mixer. The two analog mono outputs allow you to connect studio monitors or active speakers. There is an additional S/PDIF optical output for direct analog to digital conversion. The headphone output has a dedicated level control which allows you to listen to the input and output. Included in the purchase is a ton of free software so that you can get the most out of your recording. You will also get more than 50 effects plug-ins, and over 100 virtual instruments to allow you to turn your computer into a complete recording studio. The high resolution 48 kHz converters provide excellent sound quality. The rugged construction makes it durable enough to handle the conditions of life on the road. It is small and compact, making it easy to take along with you anywhere you want to record. To top things off, the UCA222 is a fraction of the price of other popular interfaces. Users report that the UCA222 produces crisp, clear audio quality. Latency is a problem for many recording artists, but the UCA222 eliminates this problem. This makes it much easier for you to focus during your recording since you can listen to what you are recording without there being any delay. It is also very easy to set up and use. You just have to plug it in to get started. A huge plus for this product is that it is good quality but has a very budget-friendly price. Users are also happy with all the extra software that comes with the purchase. It is durable as well as compact and light, making it easily portable. The only complaint some users have is that they hear a buzzing sound when recording. If you just need a simple, good quality interface, this is definitely a great option. At such an affordable price, you can’t go wrong.